A game of suspense, strategy, and anticipation. Get rid of the high cards (rats) and go for the low cards (cats). Sneak a peek, draw two, or swap cards for an added twist. Low score wins the game. (a poker face helps!) As children play Rat-a-tat Cat, they develop a sense of timing and an understanding of basic, but essential, mathematical concepts. 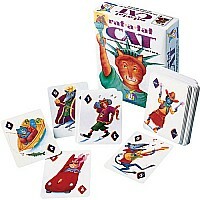 They learn ways to remember their cards and strategies to figure out what cards other players might have. They also begin to develop an intuitive sense of probability. 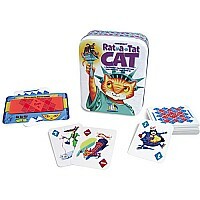 Rat-a-tat Cat requires skill, strategy, and awareness, challenging both young children and adults. Measures approximately: 4.75 x 5.75 x 1.50 ..